State officials are investigating testing irregularities at the Ramon E. Betances Early Reading Lab School in Hartford, and, following the release of an investigative report, school officials acknowledged that the tests had been altered. 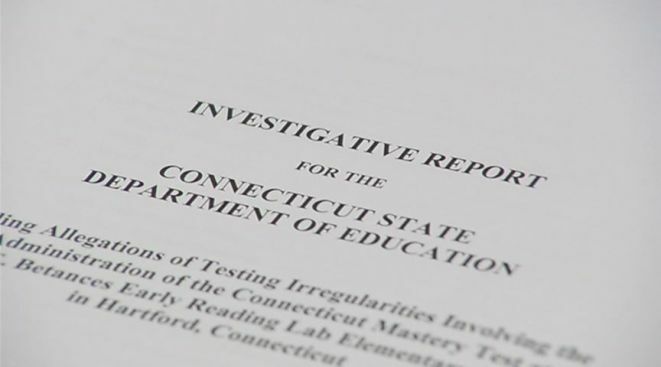 The investigation, conducted by Siegel, O'Connor, O'Donnell & Beck, P.C., released its first report Nov. 6, was launched in August after the State Department of Education identified possible testing irregularities in the third grade Reading Comprehension section of the 2013 Connecticut Mastery Test. "Based on the information gathered during interviews and an analysis of abnormal erasure patterns, the investigators found that there is sufficient evidence to conclude that irregularities were present and that changes were made to the students' 2013 CMT reading tests by persons other than the students," said State Dept. of Education spokesperson Kelly Donnelly. "As a result, Betances' scores for the 2012-13 school year will be considered invalid." “Although we have concerns about the process and the report, we accept the findings,” Kishimoto said. “At Hartford Public Schools, we take testing integrity very seriously. Neither the Board of Education nor I tolerate adult interference with student tests." The investigation found that there were an abnormal number of erasures on the tests at Betances, which were administered March 6, 7 and 11 of this year. According to the report, 27 of the 42 third-grade reading content area test booklets were found to contain "a greater amount of erasures on questions answered correctly than was considered a statistically acceptable level." Thus, 64 percent of the test booklets showed "statistically irregular answer patterns," more than twice the amount needed to categorize the tests as irregular. Some of the altered booklets had up to 31 erasure marks. One test, which was scored at 100 percent, had 22 erasures, all of which corrrected wrong answers, the report shows. Investigators interviewed a number of teachers, including three third-grade teachers who served as test proctors; an associate teacher who distributed the third-grade test booklets, the 2012-2013 Dean of Professional Development and Literacy Coach, the school principal, the head custodian, the Hartford Public Schools Coordinator of Assessment Programs and Communication and several students who took the test, according to the report. “It is distressing that no person has been identified as having altered the tests," said Kishimoto. "A finding of wrongdoing without identifying any individual has a negative effect on students, families and staff. We are all left with unanswered questions. The Betances school includes Pre-K through third grade and focuses on developing early literacy skills.